In an odd turn of events, firefighters were the ones starting the fires at the latestausterity protest in Spain. Spanish firefighters clashed with riot policein Barcelona Wednesday as they protested against spending cuts in Catalonia, the economically powerful northeastern region of the country. Labor unions that represent the firefighters warned in a statement that the proposed reductions in staff and spending put the “safety of workers and the people of Catalonia” at risk, according to Agence France-Presse. The fiery protest is one of many to hit the streets of Spain in recent months as the European country has struggled to overcome its severe budget deficit. In February, dozens were arrested after scuffles between protesters and police broke out during a mass demonstration in Madrid, Reuters reported at the time. According to the Associated Press, the European Union eased its tough stance on austerity Wednesday when it granted several member states, including Spain, more time to get their budget defects under control. However, the countries must now turn their focus to their labor markets and implement reforms to bolster national economies, the European Commission said. See more photos of the fracas between firefighters and police in the gallery below. 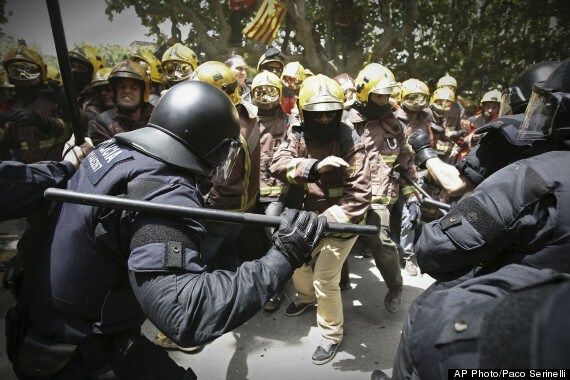 via Firefighters Clash With Riot Police In Spain During Austerity Protest (PHOTOS).